Preheat oven to 350°. In a large bowl, combine flour, 1 cup sugar, baking soda and salt. Combine buttermilk, egg and oil; stir into dry ingredients just until moistened. In a small bowl, combine cinnamon and remaining sugar. Grease the bottom only of a 9x5-in. loaf pan. Pour half of the batter into pan; sprinkle with half the cinnamon-sugar. Carefully spread with remaining batter and sprinkle with remaining cinnamon-sugar; cut through batter with a knife to swirl. Bake 45-50 minutes or until a toothpick inserted in center comes out clean. Cool 10 minutes before removing from pan to a wire rack to cool completely. 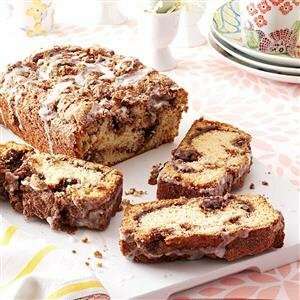 Combine confectioners' sugar and enough milk to reach desired consistency; drizzle over loaf. Makes 1 loaf.